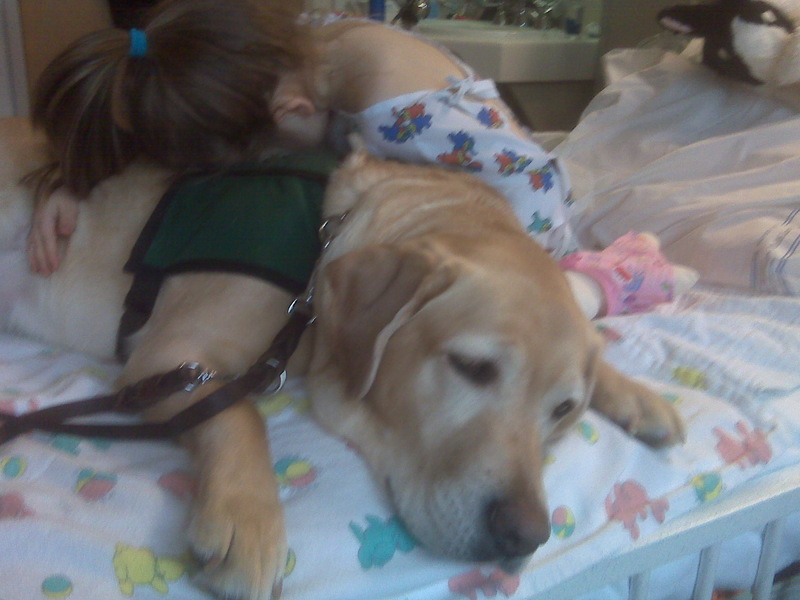 Yesterday’s hospital visit tore at my heartstrings. Lira and I walked into a room where a young pretty Asian woman was sitting in a chair by her bed with a pillow held to her stomach. Her husband was sitting on a cot on the other side of the hospital bed and her sister was in a chair in the corner of the room. Her sister had just flown in from the East Coast. You could tell that this young woman had the total support of her family. Her husband was thrilled to have Lira visit them. He came over to the other side of the bed to greet her. He proceeded to tell me how he had been involved in pet therapy and emergency medicine when he was in the military. He asked his wife gently if she minded the telling of their ordeal. You could tell and feel how much this young man loved his wife as he gently stroked her cheek while telling their story. Lira hopped onto the hospital bed beside the patients chair so she could be stroked while we visited. I not sure why but Lira seems to be the conduit to peoples stories. About 8 days ago his wife had excruciating pain in her abdomen. He took her to a VA hospital and it appears that there was a misdiagnosis. The couple was told that there were no signs of cancer. His wife continued to be very sick. He took her to a civilian facility and they found that she was indeed very sick. They had one big problem… no insurance. He told me with pain in his eyes how he literally begged and pleaded to hospital authorities to help him. “I’ve served my country; I’ve saved lives, I done everything right. Please please help me save my wife.” He said he felt so humiliated as he begged. I’ll never forget the look in his eyes. I tell you… when I hear a story like this my stomach tightens up and I feel ashamed. One of the doctors that specializes in this field was suppose to leave for a conference that day. The hospital told the patients husband they would help them and not to worry. They would do what needed to be done and that they would worry about the other later. The doctor postponed her trip and performed a major operation on the young woman. I’m proud of the hospital that Lira and I volunteer at. The young man told me how his wife was from Asia and dogs are not as revered there. When she came to the United States she was apprehensive about having a dog. Now the little dog sleeps with her every night and she misses him terribly. She smiled as she stroked Lira and talked about their little dog. Her husband commented how this was the first time he had seen her smile since the whole ordeal started and how good it was to see that smile. They were very grateful for the visit. Did you know that if major companies paid the taxes they rightfully owe that programs such as the VA could be properly funded? So many company’s funnel their money through other countries legally I might add. They call it income shifting. Google alone has funneled money through Ireland, then to the Netherlands, and then through Bermuda who has a corporate tax rate of zero. Microsoft does similar funneling and Face book is in the process. This is costing the United States 60 billion dollars every year. This money could pay for example 48,000 miles of highway, 1.2 million teachers for one year, one year of college for 8.5 million students and programs for our veterans just to name a few of the possibilities. I am only mentioning three companies here in this little blog. It seems to me that they should want to give back to the country that enabled them to flourish. How much money does one entity need? If we all spent just $5.33 dollars a month (64.00 a year) on Made in America merchandise we could create 200,000 jobs. YES that’s 200,000 jobs! Here are a few links to help you find Made in America products. This is just one story of a veteran and his family. These veterans are Made in America with pride, sacrifice and the rights of freedom to write a blog like this. Thank you to each and every one of you AND your families for your service and sacrifice. Extrmeely helpful article, please write more.